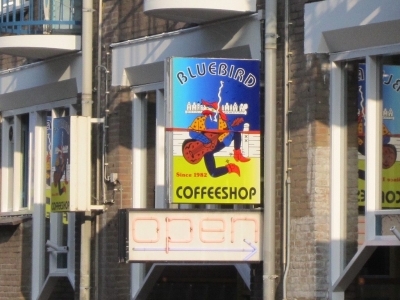 Bluebird coffeeshop is located in the Nieuwmarkt district of Amsterdam. It is right near Rembrandthuis, once the home-turned-museum of the famous painter. Bluebird is an unpretentious shop. You will not find metallic silver floor tiles or a disco ball here. Instead, it is a down-to-earth coffeeshop. That is not to say it is boring. To the contrary, it is quite interesting. The windows and architecture are fairly open and modern, and the shop is inviting. There is cool artwork hanging on the walls, ample seating, and even a comfortable couch. We would best describe Bluebird Coffeshop as a “chill” location. This shop is moderate in size, and split into two levels. The ground floor hosts a couple of outdoor tables, a small amount of indoor seating, and a counter for borrowing bongs and other smoking supplies. You have to walk upstairs to find the main area of the shop. Once here, you will notice a counter for ordering snacks, coffees, teas and others drinks, as well as cannabis to the right. To the left, a closed smoking room for those that prefer mixed joints (with tobacco). Seating can be found around the rest of the floor. Bluebird Coffeeshop has plenty of interesting corners and nooks, so you should not have much trouble finding a spot that is right for you to hang out for a while. Though be warned, this place is popular. 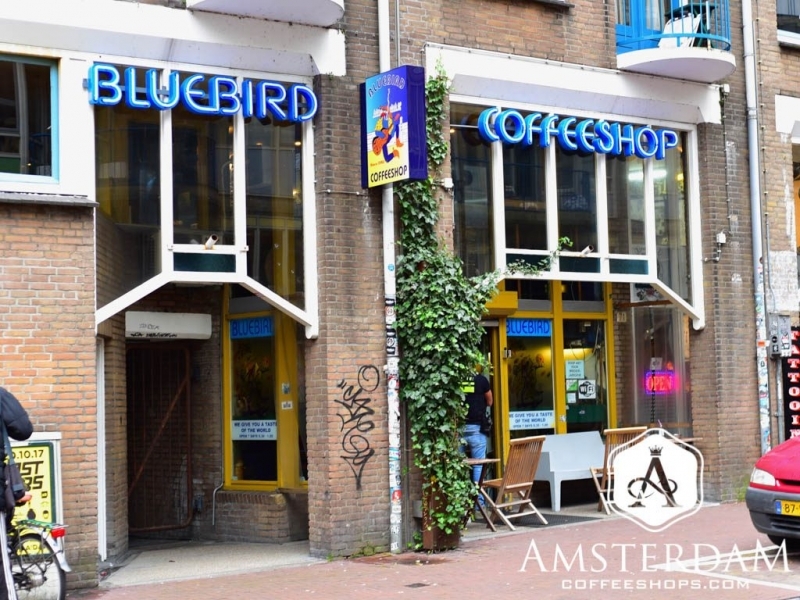 Bluebird Coffeeshop has long been known for its cannabis menu, and has entered competitions on occasion. They typically have an extensive and diverse list of offerings. When everything is in stock, the weed menu will usually list nearly two dozen strains. These range from low potency (economical) imports for beginners, to the high THC contemporary varieties coveted by connoisseurs. Their hash menu is arguably more impressive. As far as diversity, again they will stock nearly two dozen items on this side of the menu. These range from traditional sieved and pressed imports from places like Morocco, India, Nepal, and Afghanistan, to high potency Dutch Ice-o-lator hash, to what they have dubbed “Super Ice-o-lators”. The quality, in our experience, is quite consistent and seems to earn this shop a fair amount of regular business. They also serve some of the other requisite items, such as pre-rolled joints and edibles. The latter come in the form of THC infused space cakes and muffins. Additionally, this shop has a pair of Volcano vaporizers available for use. This makes it one of the better Vapor Lounges in the city. simply amazing well suited to older people. been visiting since early 90's,met Dom one chilled & knowledgeable guy,last visit 2015,very nice lady gave great advice on products,didnt meet Dom but heard the dreads are gone it comes to us all mate it's how you do it,be over in March hope to see you,still owe you 200 gliders or around E80,happy Christmas to all. Bluebird Coffeeshop is an unpretentious connoisseur shop that cultivates a chill and welcoming vibe. Their cannabis menu is extensive on both the weed and hash side, while their pricing is quite reasonable in comparison to other shops on this level. We find Bluebird to be an excellent establishment, and worth a special trip.